Beavercreek’s Diana Benigno (10) challenges a Springfield player for the ball. Undefeated Beavercreek was named the top seed of the Division I Dayton sectional tournament this season. 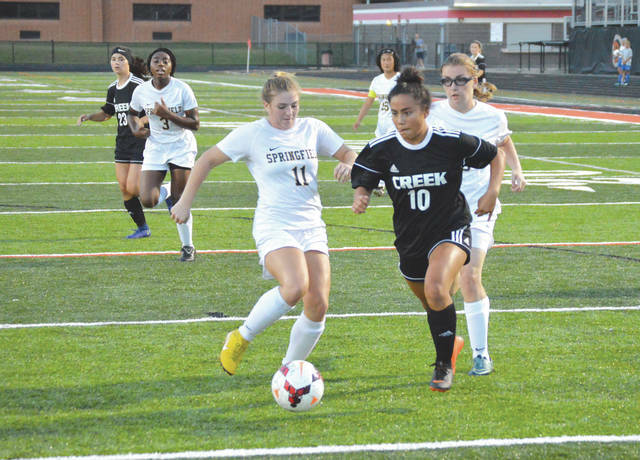 GREENE COUNTY — Undefeated Beavercreek was named the top seed in the high school girls Division I sectional postseason tournament, and several other Greene County schools earned high seeds as well, as the tournament pairings were drawn Oct. 6. No. 10 Fairborn at No. 9 Tecumseh, 7 p.m.
No. 11 Xenia at No. 5 Northmont, 7 p.m.
Fairborn-Tecumseh winner vs. No. 3 Springboro, 7 p.m.
Northmont-Xenia winner vs. No. 13 Fairmont, 7 p.m.
Sectional Final, 7 p.m. at Centerville HS. No. 15 Springfield at No. 1 Beavercreek, 7 p.m.
Beavercreek-Springfield winner vs. West Carrollton, 7 p.m.
No. 8 Butler vs. No. 12 Piqua, 7 p.m.
Sectional Final, 7 p.m., at Doug Adams Stadium, Xenia. No. 7 Chaminade Julienne vs. No. 13 Stivers, 7 p.m.
No. 6 Valley View vs. No. 10 Oakwood, 7 p.m.
No. 3 Bellbrook vs. Chaminade Julienne-Stivers winner, 7 p.m.
No. 4 Fenwick vs. Valley View-Oakwood winner, 7 p.m.
Sectional Final, 7 p.m. at Fairmont HS, Kettering. No. 5 Northwestern vs. No. 8 Kenton Ridge, 7 p.m.
No. 2 Carroll vs. Northwestern-Kenton Ridge winner, 7 p.m.
No. 10 Greenville vs. No. 3 Greenon, 7 p.m.
Sectional Final, 7 p.m. at Piqua HS. No. 18 Indian Lake vs. No. 19 Ben Logan, 7 p.m.
No. 8 Greeneview vs. No. 25 Southeastern, 7 p.m.
No. 3 Lehman Catholic vs. Indian Lake-Ben Logan winner, 5 p.m.
No. 27 Yellow Springs vs. Greeneview-Southeastern winner, 7 p.m.
Sectional Final, 7 p.m. at TBA. No. 13 Botkins vs. No. 26 National Trail, 5 p.m.
No. 5 Troy Christian vs. Botkins-National Trail winner, 7 p.m.
No. 6 Preble Shawnee vs. No. 11 Legacy Christian, 7 p.m. Winner vs. Cincinnati 2 bracket winner, 7 p.m., Oct. 27, location TBA. https://www.fairborndailyherald.com/wp-content/uploads/sites/50/2018/10/web1_BenignoS1110_PS.jpgBeavercreek’s Diana Benigno (10) challenges a Springfield player for the ball. Undefeated Beavercreek was named the top seed of the Division I Dayton sectional tournament this season. File photo. The area’s boys high school soccer sectional tournament draw will be listed in Wednesday’s papers.